The apartment is located in a quiet and green residential area in the southeast of the water town Fürstenberg / Havel. To the city center is about 15 minutes walk. There are all shops, cafes, restaurants, post office, bakery etc. The train station is about 20 minutes on foot. From there the hourly regional train to Berlin Central Station (travel time 1 hour). The apartment is actually a separate holiday home, which is located in the former Nebengelass to the main building (it consists of the white and the brick building part, which can be seen in the photo). In the main house lives the owner of the property, which is a total of about 1,200 square meters and lovingly planted, so that it is almost not visible from the neighboring properties. The apartment is about 55 m² in size and in the hall, living room (with sofa bed for 1-2 tenants), bedroom (double bed for 2 tenants), bathroom with shower, separate toilet and kitchen is divided. The apartment was completely renovated in 2017 and furnished to a high standard. In front of the house is a large covered area, which can be used exclusively by the tenants. There is also a barbecue. From the house you look directly into the garden. At the windows mosquito repellent is present in every room. Parking is available in front of the property. Bicycles can be parked in the garage on the property lockable. 5 bicycles (three 28 er, one 24 er and one 20 er - children's bike) are available free of charge for the tenants. Laundry packages can be ordered separately and cost 10 Euro / person. Final cleaning is included. There is a room with shower, sink and storage space. The room for the toilet with extra hand basin is located in a separate room. All rooms have windows. Die Wohnung war für unsere Bedürfnisse ideal. Sehr sauber und modern eingerichtet. Die Vermieterin Frau Harm ist sehr hilfsbereit und zuvorkommend. Wir werden die Wohnung jederzeit gerne wieder mieten und können Sie daher nur empfehlen. Wir hatten ein paar schöne Tage in in Fürstenberg. Die Zimmer sind sauber und gemütlich eingerichtet. Es fehlte an nix. Den Garten konnten wir im sonnigen Herbst für das späte Frühstück nutzen. Die Kinder waren willkommen und fühlten sich wohl. Uns hat es sehr gefallen und wir kommen gern mit etwas mehr Zeit im Gepäck wieder. Wir wurden sehr freundlich empfangen und haben uns gleich wohlgefühlt. Die Wohnung war modern und gemütlich eingerichtet. Besonders haben wir uns über die Fahrräder gefreut, die kostenlos zur Verfügung standen. Wir wurden bei unserer Anreise sehr freundlich empfangen und haben uns daher sofort wohl gefühlt. 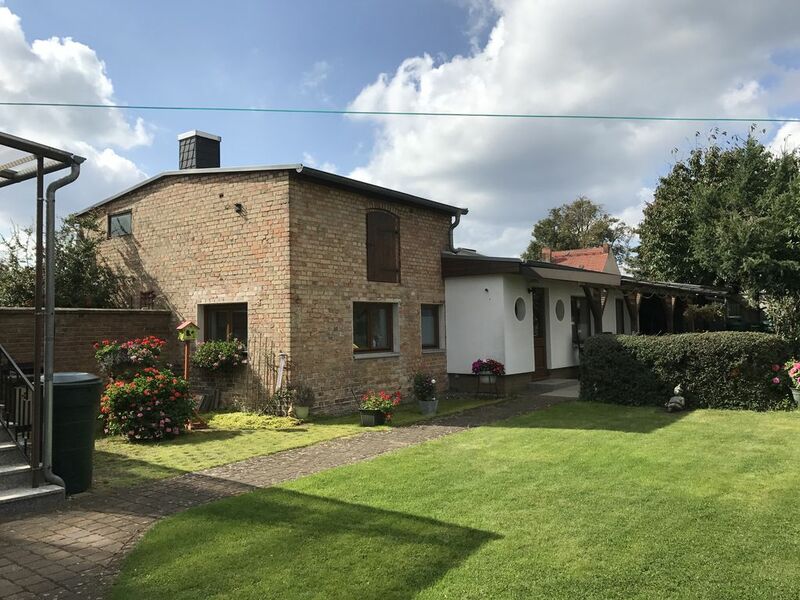 Der Ferienbungalow ist in einer ruhigen Wohngegend gelegen und daher ideal um sich zu entspannen. Die Unterkunft ist sehr sauber und entspricht absolut den angegeben Bildern. Für unsere Tochter (1,5 Jahre) wirde uns sogar ein Beistellbett und ein Hochstuhl bereit gestellt. Wir können die Ferienwohnung ohne Bedenken weiterempfehlen! Nach netter Begrüßung durch die freundliche und hilfsbereite Vermieterin konnten wir direkt die nähere Umgebung mit den zur Verfügung stehenden Fahrrädern erkunden. Zum Frühstück bietet sich die Rathaus-Bäckerei im Ort an; in der Näge locken Badeseen, Wälder, Draisine und viele Paddel-Angebote wie das von Fred Bandelow an der Bredereiche.